While still in its infancy you can already find a few pictures at Ian Besch. The pictures so far are all from Islay, I really like the Port Charlotte, Islay one. 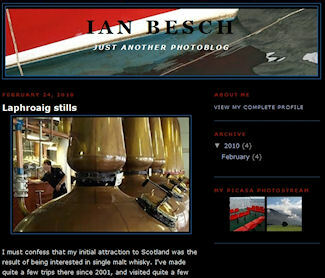 Ian plans to mainly post pictures from Scotland (in particular Islay), but also some from Canada. where he lives. You can also see a few in his Picasa Gallery, including several from Islay. Welcome to the ‘Blogosphere’, Ian!